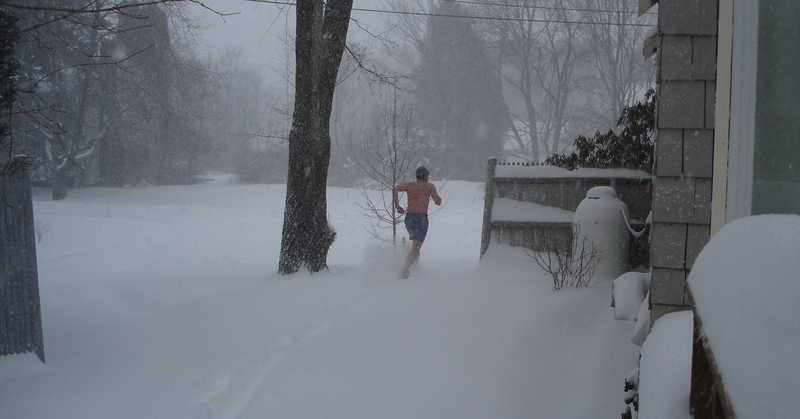 An essential and exciting part of the first big snowstorm was the annual “two laps around the house in a swimsuit” event. Not everyone participates in this event, but I did. After that I did a quick roll in the snow, followed by a hot shower. Mmm! P.S. Sharp eyes will notice a propane tank, and will wonder what that’s for. It’s attached to a heater in the cellar. Foolishly, when we moved in in 2009, I had the tank filled (at great cost). We’ve run the heater a total of 15 minutes, and that only to get it warm enough down cellar to wax skis. Anyone want to buy 100 gallons of LPG at a good price? This entry was posted on January 15, 2011 at 8:15 am and is filed under Uncategorized. You can follow any responses to this entry through the RSS 2.0 feed. You can leave a response, or trackback from your own site. Are you serious about that? My MIL just had a generator installed in Limington and has two 100 gal tanks that are only partially filled. I’m up for that. Still debating about rolling in the snow though. Aren’t you supposed to preheat in the sauna first? That’s Finnish wisdom… but then again they top the list and exceed us in coffee consumption, suicide, and heart disease.